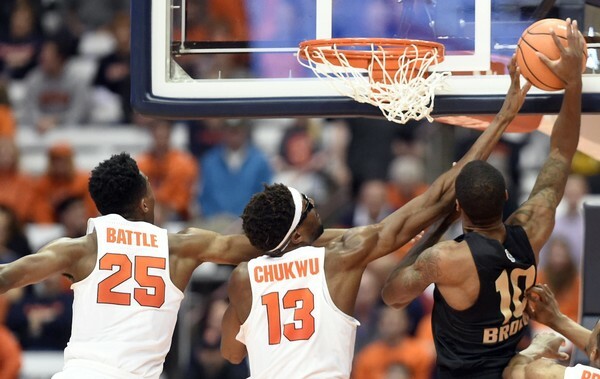 For much of his career, Paschal Chukwu was used as a scapegoat. He was often criticized by Jim Boeheim and blamed by Syracuse fans across central New York. But for all of his flaws, Chukwu was a solid defender, who used his length to alter shots every game. He never fully grasped control of his 7-foot-2 frame, but he hustled up and down the floor every single game. Without Chukwu, Syracuse doesn’t dethrone Duke at Cameron Indoor this season. Squaring off against Zion Williamson, Chukwu recorded a double-double, snagging 18 rebounds to go along with 10 points. In a game that many expected Chukwu to get bullied inside, the big man held his own, even though he was giving up about 60 pounds of muscle. He had a tendency to play his best basketball in the biggest games. Besides his best game of the season against Duke, Chukwu had a solid performance against Virginia at the end of ACC play. Of course, expectations must be within reason for Chukwu. He won’t rack up 20 points, but he put down eight points to go along with eight rebounds against UVA. Against Pittsburgh in the ACC Tournament, Chukwu tied a season high with six blocks and was a huge reason why the Panthers had just eight buckets from two-point range. But next year Bourama Sidibe will likely slide in as the starting center, unless SU adds another recruit late in this cycle. Marek Dolezaj isn’t strong enough to play more than a few minutes in the middle of the zone, and incoming freshman John Bol Ajak is still very raw since he’s only been playing basketball for a few years. Sidibe’s stats took a slide across the board this year as he played less minutes. Too often, he struggled to rise up and contest for a rebound, and was often unable to finish off putback buckets. Boeheim often decided to play Marek Dolezaj at center in tandem with Oshae Brissett at power forward. That lineup worked, since Brissett could bring some beef to the paint while Dolezaj provided the length. Of course, it’s always better to have one guy who can maintain the low blocks by himself. 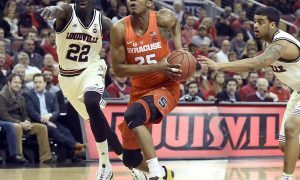 With Chukwu gone, Syracuse doesn’t have a center it can rely on for 20 minutes a game unless Sidibe takes a huge step. Without Chukwu to protect the rim, there may be a gaping hole around the hoop next season.